Transparency Market Research (TMR) observes, the Malaysia medical tourism market is highly competitive due to presence of number of companies operating in the market. Some of the key players operating in the Malaysia medical tourism market are Pantai Holdings Berhad, Dentalpro Group, KPJ Healthcare Berhad, Island Hospital, and Prince Court Medical Centre. Despite of this competition and presence of numerous players, the market is dominated by the handful of companies which is leading to increase consolidation of market. A report estimates, the medical tourism market in Malaysia is expected to attain value of US$3.5 bn by the end of 2024 with a CAGR of 30.05% over the forecast period of 2016 to 2024 from valuation of US$424.96 mn in 2016. Based on the procedure type, the dental treatment segment dominated the medical tourism market in Malaysia in 2016 accounted for 36.6% of shares in the market. Additionally, the segments such as cosmetic surgeries, orthopedic treatment, and regular health screening segments collectively accounting for 70% of the shares in the medical tourism market in Malaysia. The Malaysia medical tourism market is gaining traction due to surging medical tourism industry and lower cost of medical services compared to the developed nations are influencing positively on the growth of the medical tourism market in Malaysia. The healthcare expenditure in Canada and US is relatively costly and has a longer waiting time which is leading to transferring the preference of patients to the other countries where healthcare facilities are better and which is likely to fuel growth of the medical tourism market. The medical tourism in Malaysia is higher from the developing and underdeveloped countries of the Middle East and North Africa (MENA) and other neighboring countries. Additionally, another factor propelling growth of the market in the Malaysia is low language barrier and presence of advanced healthcare infrastructure. Tax exemptions by government on the income of hospitals from foreign patients also excellent transport facilities is fuelling adoption of the medical tourism and likely to fuel growth of the global medical tourism market. In addition, the medical tourism in Malaysia, offers the services in comparatively in the low cost. Thus, the attraction to the cheap yet the quality and efficient medical care is propelling the medical tourism industry in the Malaysia. Furthermore, rise in the sport events in the Southeast Asia is encouraging growth of the medical tourism due to growing incidence of injuries. These growing incidences are boosting growth of the medical tourism market in Malaysia. Also, growing geriatric population which are susceptible for chronic diseases are fuelling growth of the market. 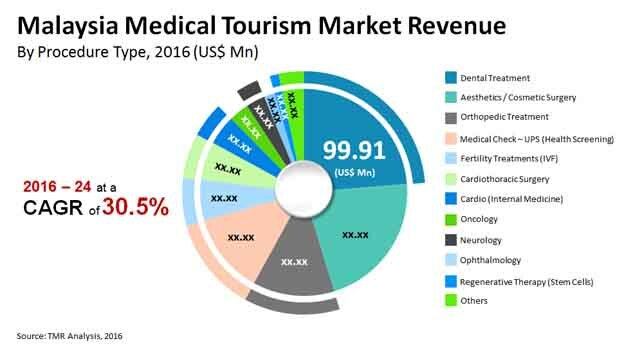 Despite these growth prospects, low revenue generation and rising healthcare cost are restraining growth of the medical tourism market. Additionally, the low cost of the healthcare is increasing burden on economy of country which is posing as a challenge to the growth of the global medical tourism market. Nonetheless, growing number of travelers are opening doors of multiple opportunities and expected to offer lucrative opportunities over the forecast period. Also, growing advancements in the healthcare and medical sectors triggered the growth of the medical tourism in Malaysia is offering opportunities over the forecast period.